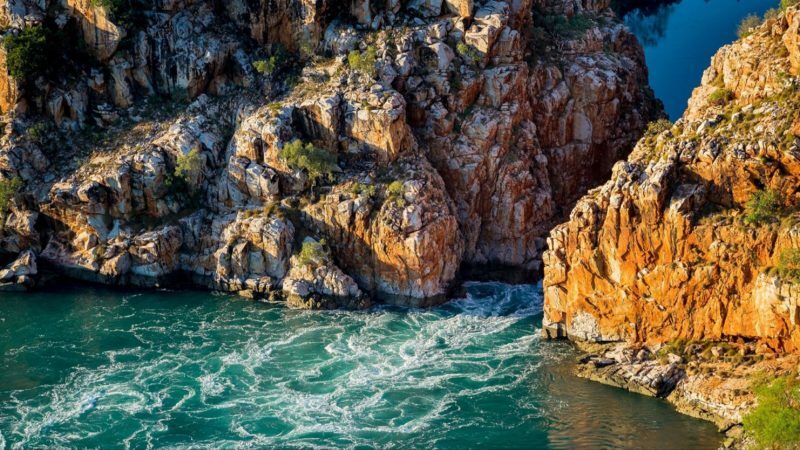 Experience the trip of a lifetime with the Kimberley’s most experienced family-owned and operated Horizontal Falls tour specialists. Whether it be half day, full day, overnight or an extended four night tour, they have something to suit every person. 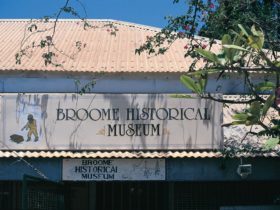 They have daily flights direct from Broome and Derby on one of their luxury turboprop Jet Seaplanes. Experience a spectacular scenic flight over the thousand islands of the Buccaneer Archipelago with a seaplane landing onto the calm waters of Talbot Bay. You will experience firsthand the incredible tidal power of this natural phenomenon as you are taken through the falls with one of their highly experienced skippers. Relax as you cruise the surrounding bays and creeks of this pristine wilderness area. Then it is time to meet face-to-face with the friendly resident sharks as you take a refreshing swim in one of their huge shark cages. Tours include a cooked breakfast or barbecue Barramundi lunch. After a 2.15pm courtesy bus pick up from your accommodation, board their 14-seat turbo prop jet seaplane and fly directly from Derby to the Horizontal Falls. Board their 900 horse-power fast boat, the fastest boat in the Kimberley for an exhilarating ride through the falls with their experienced skipper. Now it’s time to sit back and relax as you cruise through the spectacular untouched surrounding bays and creeks and experience the thrill of swimming in their huge crocodile/shark free cage and feeding the friendly fish. Relax in the privacy of your own air-conditioned cabin on board their luxury houseboat and have nibbles and sunset drinks before dinner. For dinner enjoy freshly caught barramundi cooked to perfection by their on-board chef as you raise a toast to the amazing Kimberley sunset. Wake up refreshed upon the calm tranquil waters of Talbot Bay and have an early morning breakfast before seaplane departure for Derby. Enjoy a scenic low level flight across Buccaneer Archipelago and King Sound prior to landing before returning to your accommodation. They position themselves in an area that provides exclusive access to the best the region has to offer. 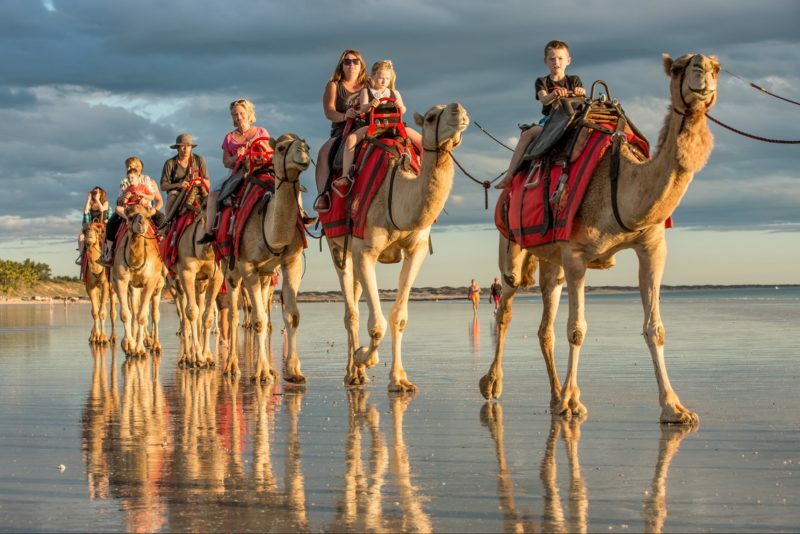 An adventure experience straight from of the pages of National Geographic, their four night Ultimate Kimberley Adventure tour reveals a part of Australia only a lucky few will ever explore. 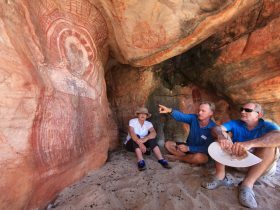 Utilising their vast knowledge and experience of this amazing landscape, they have created a Kimberley tour unlike any other. Beginning with a scenic seaplane flight over the Buccaneer Archipelago and a water landing on Talbot Bay, you will be welcomed on board the Barrashack, their luxury custom built house boat. With both a helicopter and a 12 metre long range expedition boat, they provide an adventure to some of Australia’s most remote and stunning locations. Over four nights enjoy a range of activities from the thrill of heli-fishing to exploring ancient rainforests. At the end of each action packed day, feel your stresses melt away as you enjoy a relaxed night of food and drink under the stunning Kimberley night sky. You will be picked up from your accommodation and then you will board their luxury 14-seat turbo prop jet seaplane. You will fly directly from Broome to the Horizontal Falls. Board their 900 horse-power fast boat “Jet Stream” (the fastest boat in the Kimberley). Experience an exhilarating thrill ride through the Horizontal Falls with their highly experienced skipper. Now it’s time to sit back and relax as you cruise through the spectacular untouched surrounding bays and creeks. Experience the thrill of swimming in their huge “Crocodile/Shark free” cage and feed their friendly fish. Enjoy a cooked breakfast or Barramundi barbecue lunch on board their luxury vessel as you take in the breathtaking scenery. Have your camera ready as you take off from Talbot Bay flying low level across the Buccaneer Archipelago, Cape Leveque, Lombadina, Beagle Bay, Willie Creek Pearl Farm, Cable Beach and Broome township prior to landing. Their courtesy bus will return you to your accommodation. 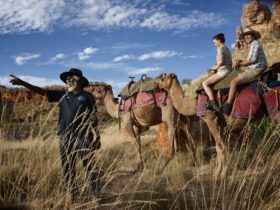 Board their custom-built Four Wheel Drive as they travel deep into the heart of the Kimberley. Their first stop is the famous pearl shell church at Beagle Bay, followed by a tea or coffee break. 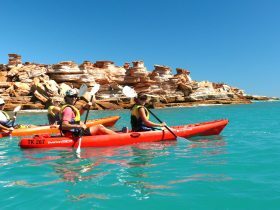 You’ll then travel to Kooljaman at Cape Leveque for breakfast and a tour of the areas stunning, unspoilt beaches. A short distance away, they visit One Arm Point community for an informative tour of their innovative aquaculture hatchery. All aboard their 14-seater luxury seaplane for a scenic low level flight over the thousand islands of the romantic Buccaneer Archipelago. Experience a spectacular seaplane landing on the calm waters of Talbot Bay. Enjoy a fresh barbecue barramundi lunch served by their amazing chef on board their luxury house boat. 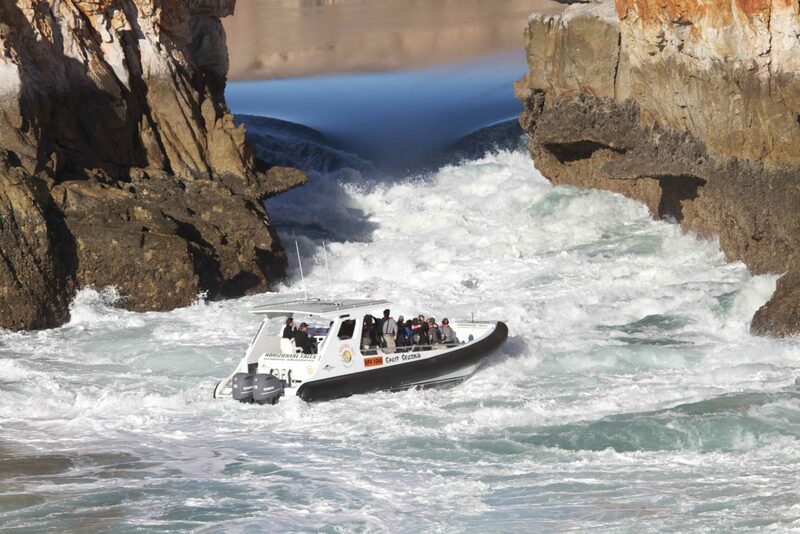 It’s time to get the heart rate up again with a ride through the Horizontal Falls on their 900 horse-power fast boat. Sit back and relax as you cruise through the spectacular untouched surrounding bays and creeks. Experience the thrill of swimming in their huge crocodile/shark free cage and feeding the friendly fish. Fly direct back to Broome with an aerial view of Cable Beach and Broome Township prior to landing. 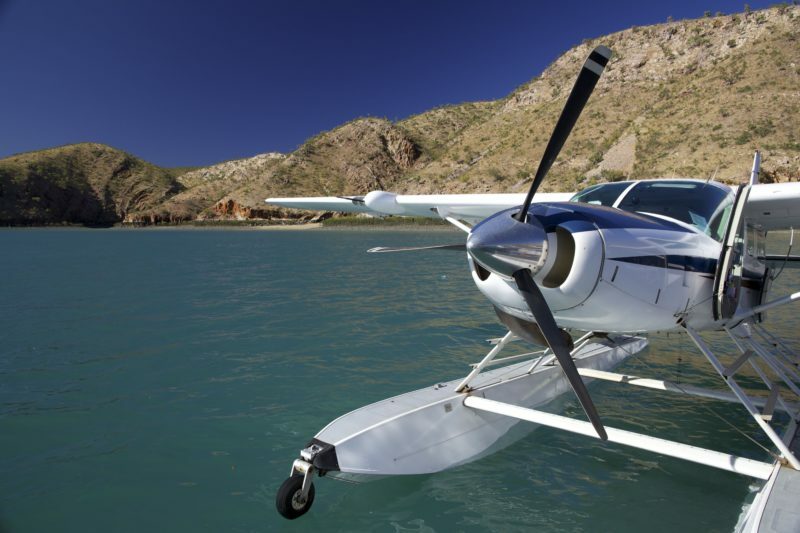 After an 8.15am courtesy bus pick up from your accommodation, board their 14-seat turbo prop jet seaplane and fly directly from Derby to Horizontal Falls. Board their 900 horse-power fast boat, the fastest boat in the Kimberley for an exhilarating ride through the falls with their experienced skipper. Get your heart rate back to normal with a relaxed cruise through the spectacular untouched surrounding bays and creeks on board their luxury vessel. Enjoy a barbecue barramundi lunch cooked by their on board chef as you take in the breathtaking scenery. Sit back and relax as you cruise through the spectacular untouched surrounding bays and creeks. Experience the thrill of swimming in their huge crocodile/shark free cage and feeding their friendly fish. Get your cameras at the ready as they take off from Talbot Bay for a low level scenic flight over the Buccaneer Archipelago and King Sound as you return to Derby. Their exclusive new Horizontal Falls overnight tour from Derby is the only one which offers you the rare opportunity to experience both incoming and outgoing tides. 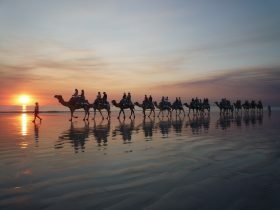 Experience 24 hours of spectacular scenery and scintillating action in a compelling combination of adventure and luxury. Thrilling seaplane and helicopter flights, fast boat rides, an exclusive fishing charter, relaxed cruising through spectacular scenery and a night on their luxury houseboat with all meals included are just some of the unique experiences that make this Horizontal Falls overnight tour the best in the business.